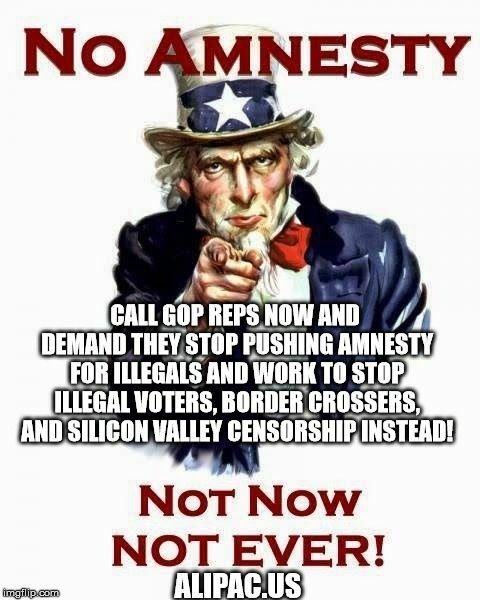 With Democrats and pro-Amnesty Republicans planning to push Amnesty legislation again during the lame-duck session of Congress this December, Americans for Legal Immigration PAC is warning GOP lawmakers that continuing to push for Amnesty instead of passing legislation to secure the border, stop non-citizen voters, and curtail Silicon Valley cyber censorship, will doom the GOP and America. Illegal immigration is at a ten year high because the Trump administration let the first caravan of fake asylum seekers enter the USA and worked with GOP leaders in Washington to support and endorse Amnesty legislation in 2017-2018 which would have rewarded millions of illegal aliens with Amnesty, citizenship, and voting rights! Americans for Legal Immigration PAC fought to stop those Amnesty bills like Rep. Goodlatte's HR 4760 because the bills encoruage more illegal aliens to illegally immigrate into the USA and eventual voting rights for millions of illegals would help the Democrat Party dominate US national elections for the foreseeable future. Now GOP lawmakers are being warned that their focus on Amnesty legislation instead of strengthening and upholding the existing laws and Constitution of the US will eventually lead to permanent minority status for the GOP and America's conservative voters. -- Abandon Dream Act, DACA, and Comprehensive Amnesty legislation which encourages illegal immigrants and illegal immigration while demoralizing, angering, and frustrating GOP and pro-America voters. "The next few weeks may be the GOP's last opportunity, with full control of all branches of government, to end illegal voting, Silicon Valley censorship of conservatives, and abuse of US asylum laws and borders," said William Gheen, President of ALIPAC. "Right now there are numerous indications the GOP will seek Democrat support for Amnesty bills again instead which is the very madness that cost them the 2018 elections and brings the GOP and America into chaos." ALIPAC recently had a 12-page report on Silicon Valley censorship of conservatives entered into the Congressional Record and Library of Congress. That report has now been sent to the Federal Elections Commission (FEC.gov) as part of a formal complaint against Silicon Valley companies using their unprecedented powers of surveillance and communications to throw elections to pro-Amnesty Democrats. ALIPAC is calling on illegal immigration fighting activists to contact all GOP members of Congress and President Trump to demand they cease efforts to pass Amnesty during the lame duck session and instead pass bills that end non-citizen voters, asylum law abuse, illegal border crossings, and censorship of conservative base voters and activists. Last edited by ALIPAC; 11-27-2018 at 01:38 PM. We need a full and strong deployment. Congress is back in DC today to start the lame-duck session, and they plan to try to pass Amnesty bills before Christmas of 2018! Our goal is to stop those Amnesty bills as we have done many times in the past. We also want to try to push the GOP away from their own political suicide and encourage them to pass bills stopping non-citizen voters, Silicon Valley censorship, and illegal asylum claims and border crossings instead. Please take the following important steps. Step 2: Call and write the following GOP leaders to say "I want you to stop trying to pass Amnesty bills for illegal aliens which encourages illegal aliens to enter and remain in the US while costing the GOP elections by demoralizing and angering conservative voters like me. Instead of trying to help illegals, I want Republican lawmakers to use the lame-duck session to pass legislation to stop non-citizen voters, Silicon Valley censorship of conservatives, and illegal asylum claims and border crossings." Step 3: Send and call in copies of our release and your personalized message to any GOP lawmakers, candidates, or party officials you can locate on the local, state, and federal level. Let's send them this message high and low. Step 4: After you have made your calls to GOP leaders, take a few seconds to click on the social media and email share buttons in this release and on our pages to notify others we need them to take action with us. Last edited by ALIPAC; 11-27-2018 at 01:39 PM. CA: Help Wanted: Illegals Encouraged To Apply?